After a night of gambling, Kenshin and Sanosuke return with an unexpected prize ? A woman. Beautiful and mysterious, Takani Megumi, the daughter of a famous family of physicians, has unwittingly been participating in the production of a super-powerful, super-profitable form of opium. 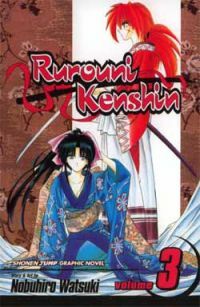 Hot on her trail is shady industrialist Kanryu, and Sanosuke may not be her best protector after the death of one of his friends from an opium overdose. But Kenshin has looked into her eyes and seen her sadness. He knows he must act ? But will he be able to save her from the wrath of Kanryu, or for that matter, from Sanosuke? RUROUNI KENSHIN © 1994 by NOBUHIRO WATSUKI/SHUEISHA Inc.